Storm? Traffic congestion? 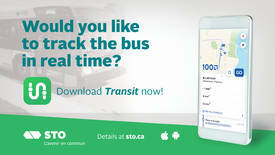 Thanks to Transit, you can find out how long it will take, in real time, for the bus to get to your stop. Do you want to stay in the shelter a few more minutes? Simply program an alert to remind you when to leave. Because it's useful, and reassuring, to see where the bus is and track it on the map. Are the bus windows fogged up? No problem! Just activate the GO feature in the app and an alert will be sent to your phone to tell you when to get off. Help us improve the tool! Do you have observations or comments? Go to the Transit app settings and click “Send Feedback”. The message is sent to Transit, which will conduct the necessary checks and inform us, if needed. When everyone collaborates, the information can be continuously improved. To learn more about the options and features offered in the app, check the user manual. 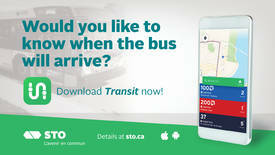 Check out Transit's web page for more features! To make Transit your travel companion, simply download the app for iPhone or Android now. Already have the app on your mobile and can't see the waves ? 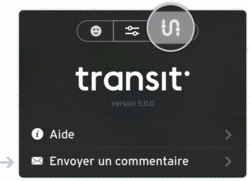 Go to the Play Store (Android) or 'AppStore (iPhone), seach for the Transit app and click the « Update » button. Real time is a prediction based on the information supplied by the bus on a route. That is why it is important to keep a good habit of going to the stop 3 to 5 minutes before the predicted real bus arrival time. Thanks to the new operational support and rider information system that the STO implemented in 2018 to track the movement of buses in the system in real time, it is possible to generate real-time open data (GTFS-RT).